Wildfires burning in the Western U.S. are threatening some of America's most treasured national parks – and in some areas, the damage has already been done. Last week in Montana, a 20-square-mile blaze burned the historic Sperry Chalet, a hotel and dining room built in 1914 and only reachable by trail. "We are saddened to inform you that Sperry Chalet has been lost," the chalet's operator writes in a post to the chalet's website. "The Sprague Fire reached the chalet around 6:00pm on Thursday, August 31. The hotel building was rapidly engulfed by fire." "This event marks a significant moment in the history of Sperry Chalet and for Glacier National Park," it adds. "We are deeply grateful for the support we are hearing from all our friends and guests. Sperry is a loved place for a great many people. It has been a great privilege to share the special charms of Sperry Chalet with so many people, we are grateful to be able to share the grief from the loss. Thank you for your support." "It's hard to think about the magnitude of what's happened," Glacier National Park Conservancy executive director Doug Mitchell told the Kalispell Daily Inter Lake. "This was an iconic part of the park ... our role is to preserve and protect for future generations." "This puts all hands on deck," he added. "We will marshal the troops and do what we can to help. Our mission is to be here for the long run." Other beloved buildings remain endangered. Glacier shared photos on Monday of firetrucks outside its Lake McDonald Lodge, built in 1913. "Fire has not reached the lodge, but every precaution is being taken," it says in a Facebook post. On Monday, wind gusts were blowing the fire toward the shores of the lake and endangering the lodge. Mark Hufstetler, a historian who spent several years working at the lodge in the 1970s and 80s told The Associated Press it would be "unimaginably devastating" if the lodge were lost—especially given the destruction of Sperry Chalet. "These are some of the most remarkable buildings anywhere in the United States and they are an integral part of the Glacier experience and the Glacier tradition," Hufstetler told the news service. And then there are the trees. 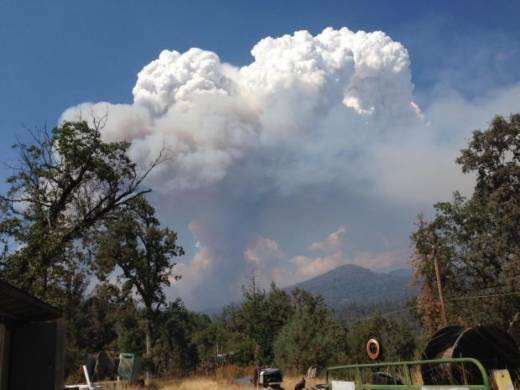 Near California's Yosemite National Park, the Railroad Fire is burning in Sierra National Forest. On Monday, the fire swept through an area called Nelder Grove, which is home to 2,700-year-old giant sequoia trees. Among the hundred or so giant sequoias there is one of the world's largest: the Bull Buck Tree: 246 feet high and 99 feet in circumference at its base. Giant sequoias have thick, fire-resistant bark — which served them well when the fire swept through. The trees were left with scorch marks, but they all survived, fire information officer Cheryl Chipman told the AP. And in Oregon's Columbia River Gorge, a blaze known as the Eagle Creek Fire has jumped the river into Washington, creating dramatic and dangerous scenes. Earlier, wildfires had spurred hundreds of homes evacuated in the Los Angeles area, but cooler, wetter weather over the weekend helped firefighters' efforts to contain it. A fire that burned four homes is no longer actively blazing, the AP reports. Of course, where there's fire, there's smoke. A blanket of smoke from numerous wildfires converged over the weekend, sending Spokane residents indoors. And far from the flames, as the National Weather Service reports, a cold front moving through the Eastern U.S. is carrying smoke from the Western fires: "Most smoke is aloft but makes for hazy skies & red sunsets."